Crystal Motor Speedway has a unique place in the history of Engine Pro Sprints On Dirt presented by ARP. Crystal had already been in operation for 28 years when SOD was created and in its early days, well known sprint car legends like Rick Ferkel and Bobby Allen raced at Crystal. Current owner/promoter Ron Flinn has continued the long-time partnership between Crystal and SOD, leasing the track in 1989, then purchasing it in 1990. Ron stands tall among our partner promoters, both literally and figuratively. Ron is 6’8” tall, or as he describes it, 5’ 20”, and is an outstanding basketball player even at 73 years old! As a longtime, very successful promoter, Ron is recognized as a well-respected leader and innovator among his fellow promoters. 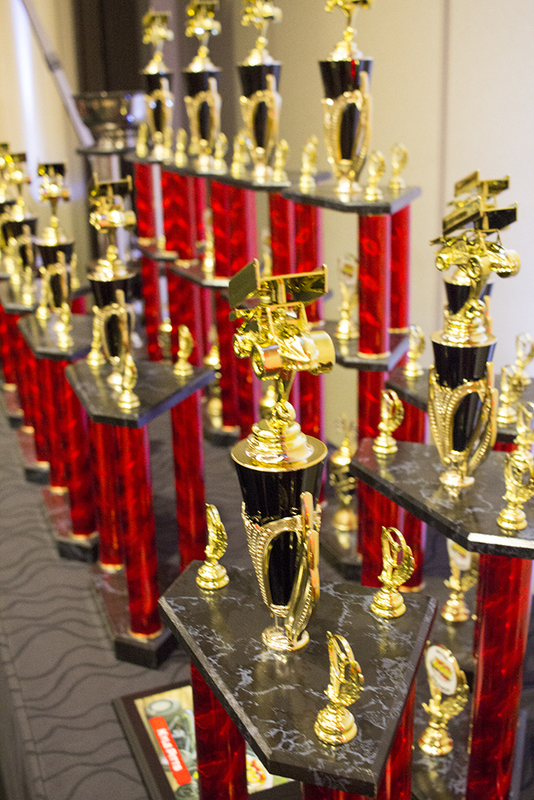 The Crystal/SOD tradition will continue in 2016 when the Engine Pro Sprints On Dirt presented by ARP will once again appear at Crystal Motor Speedway on three dates, April 30th, July 16th, and September 3rd. The July 16th race will be the annual Mike Olrich Memorial. Mike was a SOD staff member and also served as series director at one time. The family tradition continues as Mike’s daughter Taylor works with SOD now. QUESTION #1 – What are the SOD spec tires for 2016? The SOD right rear is a Hoosier 100/13-15, medium compound. The SOD left rear is a Hoosier 92/12.5-15, D15 compound. QUESTION #2 – Why have the tires changed? The primary reasons the tires were changed were to achieve a level of competition that will help the sport of sprint car racing not only survive, but thrive in the future and to control costs. This will be accomplished through SOD’s immediate objectives: increasing car counts, decreasing competitor costs, bringing additional interest and sponsorship into the sport, and providing its promoter partners and race fans with affordable, exciting racing. QUESTION #3 – Did SOD meet its objectives and how? First, SOD determined what requirements would be necessary to meet its objectives. Hoosier Racing Tire then applied their expertise in racing tire design and development to produce tires that would meet SOD’s requirements. Once prototype tires were manufactured, the tires were tested in strictly controlled 360 and 410 test sessions. The results of testing were exactly as needed to meet SOD’s objectives. QUESTION #4 – What is the SOD rule for wheels? QUESTION #5 – I was told that the left rear tire is a late model tire? No, that was a false rumor. While the right rear is a sprint car tire that has been around a long time, the left rear is a new tire per SOD’s requirements, designed and built by Hoosier for winged sprint cars. Although late models tires are required as spec tires by some sprint car sanction organizations, that is not the case with SOD. QUESTION #6 – I hear tire costs will skyrocket? No, there will be no increase in price for tires bought from SOD in 2016. QUESTION #7 – Do the tires have to be bought from SOD? No, we suggest that you purchase the tires from your regular Hoosier Racing Tire supplier, but you can also buy them from SOD if you prefer. Another rumor was that SOD would charge anything they wanted since the tires could only be bought from them. In reality, Hoosier can and does sell these tires through anyone they want; SOD does not have exclusive rights to the tires. QUESTION #8 – Is it going to cost $400 just for the spec tires before the race even starts? Yes, just like last season. There will be no price increase in 2016. In 2015 a SOD right rear tire price was $200 and a left rear was $220, totaling $420 per set. Sprint car teams have changed tires to gain a competitive edge; better financed teams have used a minimum of three left rears per show. That translates into at least $860 in tire costs for those who could afford it. With a single left rear tire in 2016, it isn’t difficult to conclude that tire costs will decrease. While no one used every available left rear tire, competitors had over 30 different left rear sprint car tire size/compound combinations available in 2015; 2016 competitors will have one. Allowing just one left rear tire will help equalize competition. QUESTION #9 – Will SOD be the only place these tires will be run? QUESTION #10 – Will fans see those rear tires once and walk away and just laugh? No. Just like when the World of Outlaws went to a 2” narrower right rear tire a few years ago, no one has noticed the SOD spec tires when they have seen them on a track. The tires maintain a true sprint car appearance in every way. QUESTION #12 – Where can I see the spec tires? The SOD spec tires will be on display in the Keizer Wheels booth (#2801) at the PRI (Performance Racing Industry) show in Indianapolis, December 10-12. QUESTION #13 – When can I buy the spec tires? 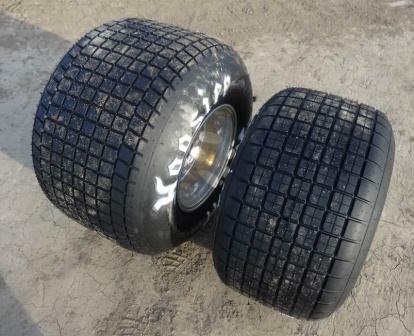 Hoosier Racing Tire will have the tires available after the first of the year. 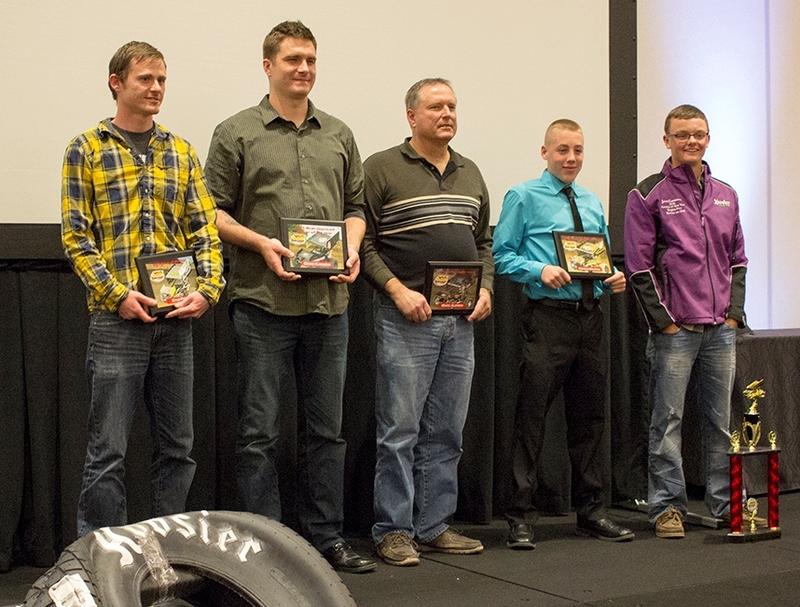 The 2015 Engine Pro Sprints On Dirt presented by ARP Awards Banquet was held at FireKeepers Casino Hotel in Battle Creek, Michigan, Saturday night, November 7. 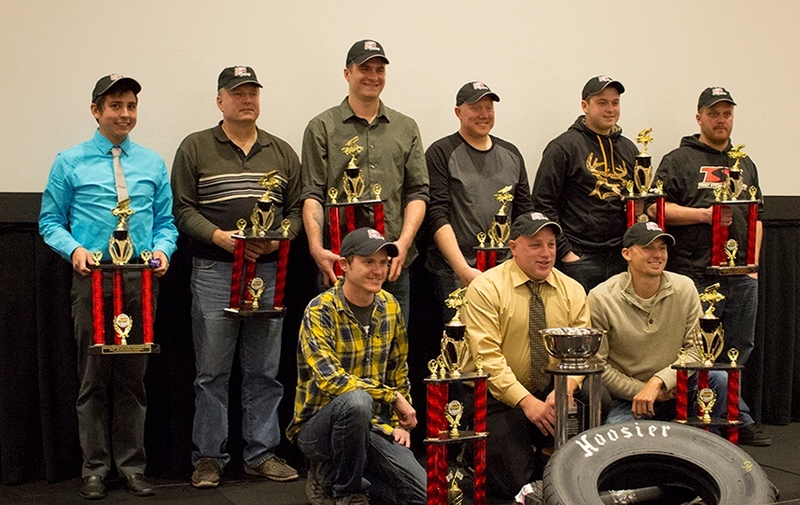 2015 SOD Champion Gregg Dalman was honored along with the other top 11 eleven drivers, special awards winners and SOD staff. 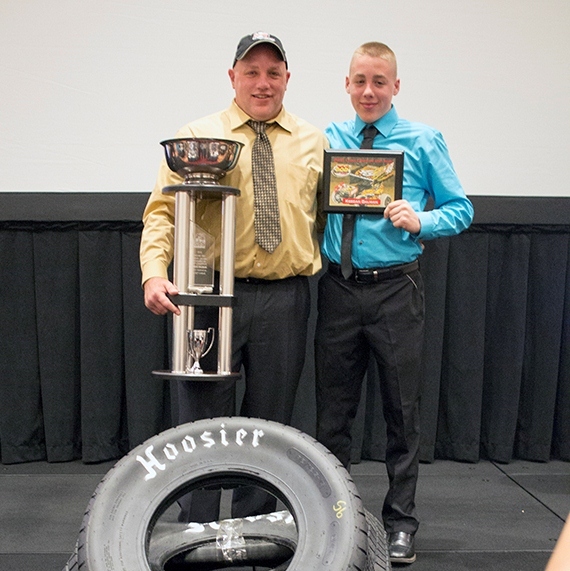 Dalman is now a two-time SOD champion, but this one was extra special as Gregg’s son, Keegan, received the award for Crew Chief of the Year making it a double championship for the Dalman family. 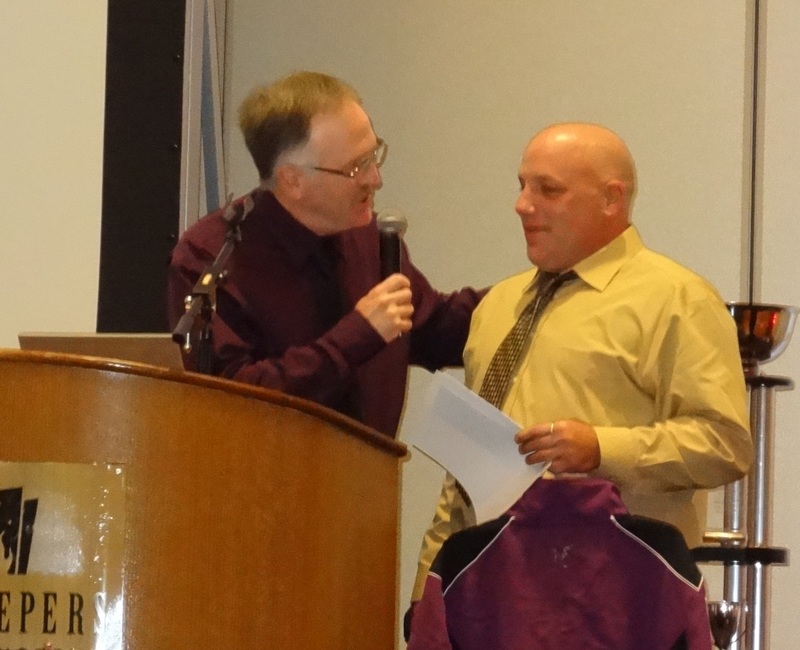 Emcee Wayne Bunn, announcer at Hartford Motor Speedway, directed the awards ceremony in front of a background presentation created and presented by Matt Miller. Thank you to both Wayne and Matt for their professional touch. Thank you to Awards Plus Laser Engraving for the great job they did on the trophies. Thanks to all of the photographers who captured all the memories and allowed us to use their shots for our media releases. A special thank you to TJ Buffenbarger for his support with our website, Facebook page, Twitter account and email system. 24 races were scheduled, 22 were complete and there were 2 rain outs. Engine Pro – Special Recognition Award and thank you for your many years of support as SOD’s title sponsor and for continuing the Lucky Dog Award program into 2015. SOD Staff: Pat & Roger Holzinger, Taylor Olrich and Rick & Debbie Irwin – Thank you for your hard work and dedication throughout the year. Pat & Roger were awarded a plaque in recognition of their continued support throughout the years! Andrianna and Steve Irwin were awarded a plaque in recognition of their tireless efforts in making the 2015 season the amazing success that it was. They took the reins of SOD just two weeks before the season began and providing the professional management that exceeded all expectations. 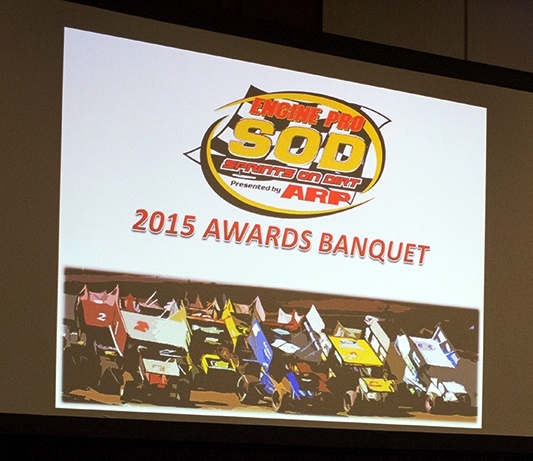 The 2015 Engine Pro Sprints On Dirt presented by ARP Awards Banquet brought the curtain down on a great 2015 season. Thank you to everyone who made it a success and see you next year!